Narrow V-Belts ANSI/RMA IP-22.—Narrow V-belts serve the same applications as multiple, classical V-belts, but allow for a lighter, more compact drive. Three basic cross sections—3V and 3VX, 5V and 5VX, and 8V—are provided, as shown in Fig. 1. The 3VX and 5VX are molded, notched V-belts that have greater power capacity than conventional belts. Narrow V-belts are specified by cross section and effective length and have top widths ranging from 3⁄8 to 1 inch. Narrow V-belts usually provide substantial weight and space savings over classical belts. Some narrow belts can transmit up to three times the horsepower of conventional belts in the same drive space, or the same horsepower in one-third to one-half the space. These belts are designed to operate in multiples and are also available in the joined configuration. 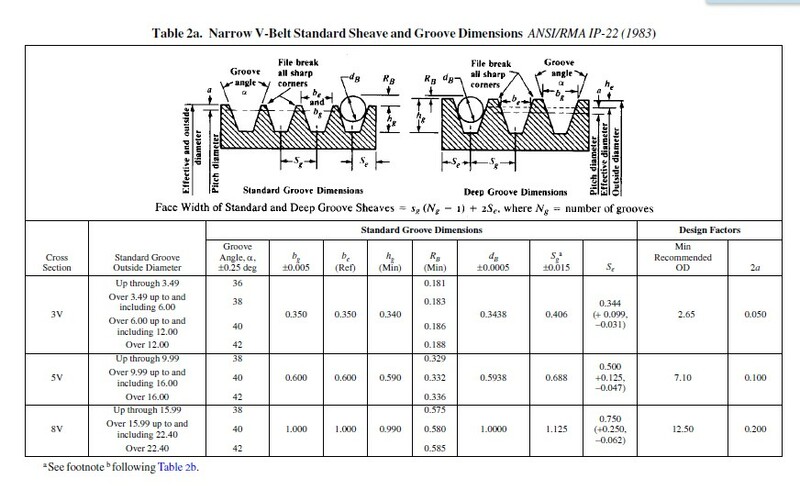 Belt Cross Sections: Nominal dimensions of the three cross sections are given in Fig. 1. 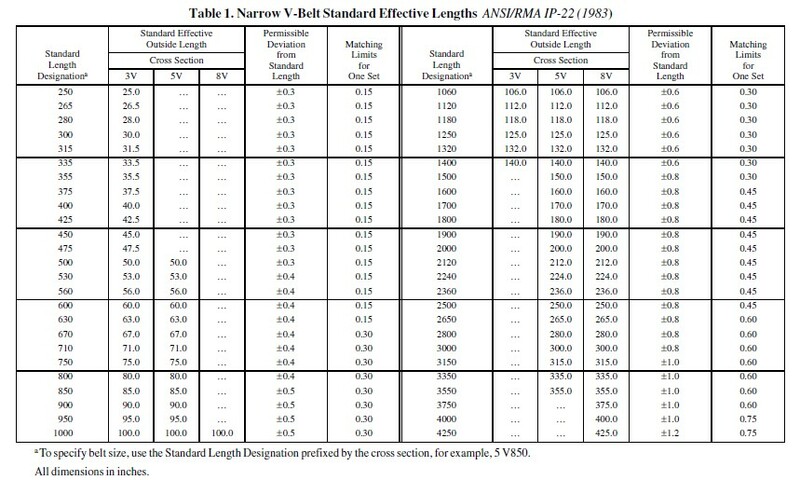 Belt Size Designation: Narrow V-belt sizes are identified by a standard belt number. The first figure of this number followed by the letter V denotes the belt cross section. 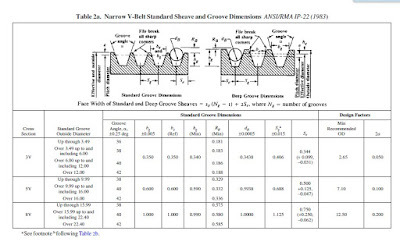 An X following the V indicates a notched cross section. 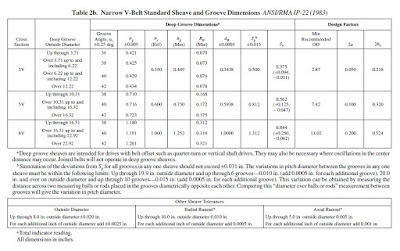 The remaining figures show the effective belt length in tenths of an inch. 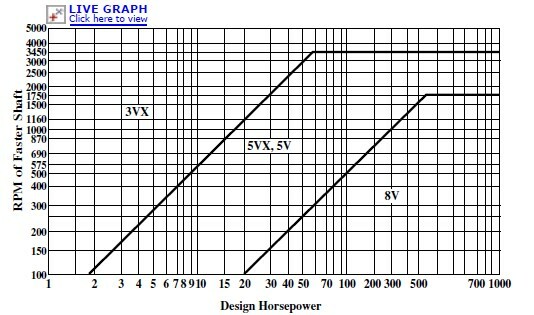 For example, the number 5VX1400 designates a notched V-belt with a 5V cross section and an effective length of 140.0 in. 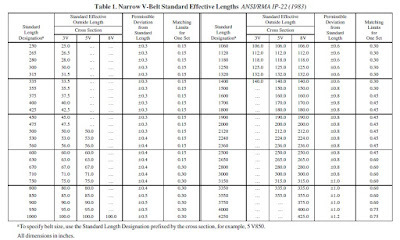 Standard effective lengths of narrow V-belts are shown in Table 1.
values. 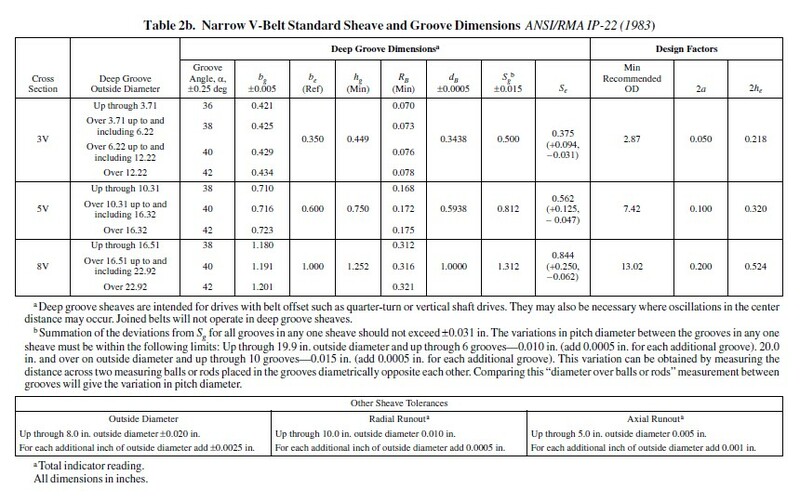 Standard sheave outside diameters are given in Table 3.